SKIN PEELING, IPL, TREATMENTS FOR STRETCHMARKS: FRENCH WOMEN’S TOP 3 FAVOURITE AESTHETIC INTERVENTIONS! Paris, August, 7th, 2014 – Promise, a marketing surveys and consulting institute specialized in the measure of brand equity from the consumer’s point of view, is publishing a few results from an important survey. That one deals with French women’s behavior towards skincare routine and cosmetics habits. More precisely, this summer, the institute is focusing on French women’s knowledge, practices and intentions towards aesthetic interventions. This evolution of behaviors and mentalities leads to question the future of skincare brands, especially those that are specialized in erasing ageing’s visible effects: will they have to caution clinical or chirurgical interventions tomorrow, besides their current skincare programs? "French women’s behavior is an echo of the evolution that has been noticed in other countries, especially the USA and South America: borderlines between skincare routine, complete skincare program and aesthetic intervention are disappearing. It’s true that there’s a cultural, psychological and maybe economical brake for using consequent chirurgical interventions. Still, the youngest women‘s important acceptance questions the future of skincare cosmetics brands vs. that new competition. The answer may consist in strengthening R&D – for instance, the investment in stem cells – as a support for innovation in anti age / skincare. That’s what LVMH Research – led by Mr. Eric Perrier – did. This answer can also consists in developing selective brands with medical and scientific deposit, sometimes approved by acknowledged personalities who are heading surgery clinics: for instance in the USA, Sephora reserves a place dedicated to "doctor lines". 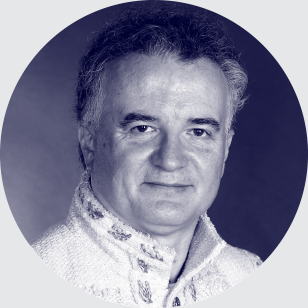 In every case, the European medical aestheticism market is strongly expanding, which interests every brand and purchase places", Pr Philippe Jourdan (Promise Consulting / Panel On The Web Founder-Partner). THE YOUNGEST WOMEN HAVE A BETTER INFORMATION! First notice: French women are perfectly aware of the various aesthetic interventions they might use. More than 8/10 of them know almost the whole 12 evaluated kind of aesthetic! From liposuction to collagen injections and breast surgery, young French women are perfectly aware of those practices. At the same time, those practices have been “democratized” in magazines for women for many years. Second notice: a more deficient knowledge concerning some practices amongst the 35-54 and amongst women above 54, including for IPL, while that technique is used in aesthetic medicine to treat ageing signs: thought that practice is known by almost 7/10 of 15-34 years old women, more than 60 % of the women above 54 have never heard about it! FROM 15 TO 34: SOFT AND BRIGHT SKIN IS THE MAIN PRIORITY – BUT NOT THE ONLY ONE! 12% of the women on this age group have already used IPL, mostly for a definitive epilation while this technology can also be used for skin remodeling without ablation and photo rejuvenation. This ratio seems to confirm the success of independent beauty institutes that mostly make promises based on that technique, i.e. photothermolysis (SPTL). 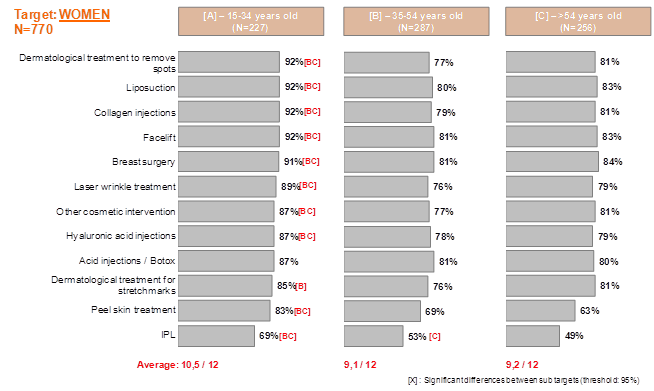 The proportion is almost the same (11%) concerning those who have used peel skin treatment, which shows that the use of this technique also concerns young adults nowadays. We have to remind that dermatologic peeling can be more or less important. A slight peeling leads to a brighter skin while an important peeling will act on ageing signs and even acne’s scars. Still, the principle is the same: ablation of some part of skin to apply a chemical component that will act on the remaining part of the skin. Beyond the noticed uses, use intention on short / middle term is promising and confirms that some psychological brakes are disappearing: 38% for IPL, 31% for peel skin treatment! Brakes are also dismissed on this age group concerning the use of remedial aesthetic acts: 26% consider acting on their stretchmarks, and almost 20% consider breast surgery, vs. only 7% amongst women above 54! Some may evoke conformism in terms of silhouettes vs. society’s diktats (breast), or maybe the refuse to assume the consequences of a potential maternity. 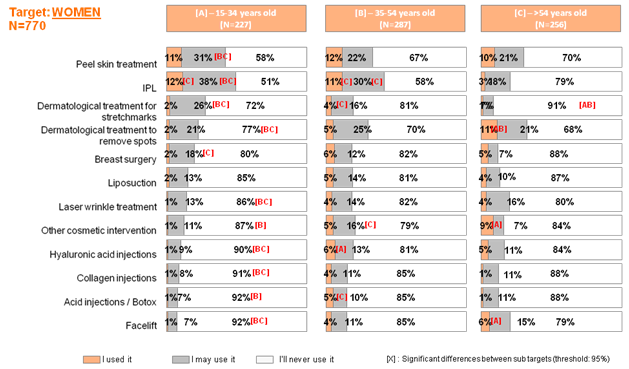 FROM 35 TO 54: LESS ENTHUSIASM TOWARDS INTERVENTIONS, BUT A REAL PREOCCUPATION TO ERASE AGEING’S SIGNS! Between 35 and 54, the use of the considered practices is barely the same, though we notice less enthusiasm towards potential interventions. In fact, only 22% of French women consider using peeling and 30% for IPL. Projects concerning stretchmarks or breast also considerably decrease. On the other hand: dermatological treatments to remove spots gain on intention, from 21 to 25%. This trend is conform to the qualitative surveys that are also led by the Institute on this target and prove that youth is more attracted by chirurgical interventions (nowadays “banal”) while adults until 54 have one preoccupation: to erase ageing’s visible signs – including spots. Above 54, interventions to remove spots are ranked first on practice (11%), followed by peel skin treatments (10%). Unsurprisingly, treatments to remove spots are also ranked first on French women’s considerations (21%), while needs for laser wrinkle treatment (16%) or lifting (15%) emerge. That’s also the key age when cosmetics are replaced by two kinds of behaviors: self assumption, which leads to the use of a natural cosmetology less aggressive, more protective... or on the opposite the will to invest in heavier interventions whose consequences can potentially also be dramatic! 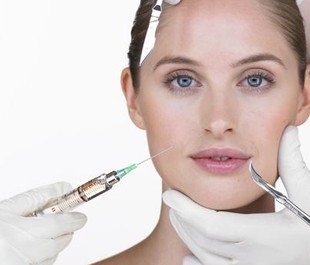 Known by most women, injection methods (Botox, hyaluronic acid, collagen, etc.) don’t seem to attract French women: in average whatever the age, only 1 woman out of 10, would be ready to use it. Those techniques mainly concern 35-54 years old women: nearly 5% of them have already used these. Here, we’re far from the scores that are usually noticed in Latina America (Brazil). At the same time, brakes are both psychological (fear of consequences) and cultural (esthetic surgery is not necessary accepted by relatives), or even budgetary, as the cost for those interventions is often superior to French women’s incomes. Promise Group is dedicated to consulting and marketing surveys. It includes the following companies: Promise Consulting Inc., JPL Consulting and Panel On The Web. Promise provides consulting and surveys services with a strong added value. Based in Paris, New-York and Casablanca, the Group conducts surveys and consulting services all around the world. The Group is allegedly known for its expertise in the measure of brand equity. Promise has developed innovative methodologies and methods that have been awarded 7 times over the last 10 years by the profession, both in France and abroad. The Group is consulted by the most important brands in luxury, cosmetics and selective distribution, especially concerning their development abroad or on their national market. Besides, the Group has the OPQCM and Social Media certifications.